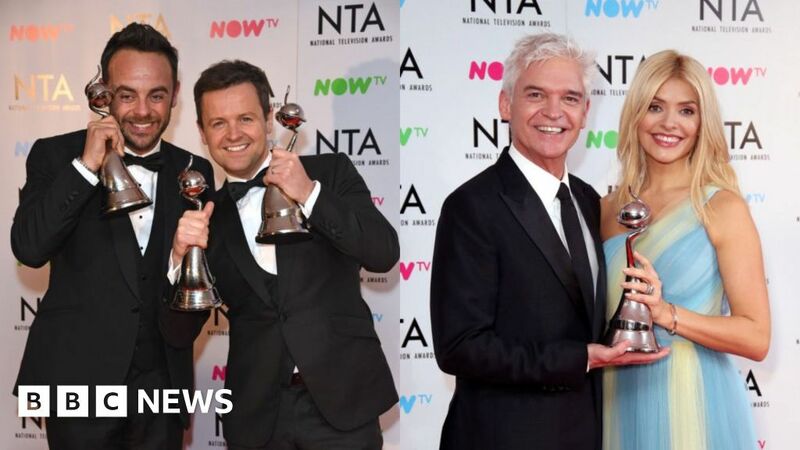 Ant and Dec have won the TV presenter category at the National Television Awards (NTAs) for the last 17 years, but can they do it again? Ant’s only presenting gig alongside Dec last year was on Saturday Night Takeaway after he took a break following his arrest for drink-driving. He was also seen in pre-recorded material for Britain’s Got Talent but Dec hosted the live shows alone. Dec then hosted I’m A Celebrity… with fellow nominee Holly Willoughby. It was the first time since the show began that Ant had stepped back from presenting duties. So could it be Holly’s turn to take home the prize? A hit with viewers for her I’m a Celeb… Get Me Out of Here! stint, her main presenting job is on ITV’s This Morning with, Phillip Schofield, who is also nominated for best presenter. The Chase host Bradley Walsh and Graham Norton are also in the running. There is also an extra category in this year’s awards – one that recognises new drama. A Discovery of Witches, The Cry and Girlfriends go up against Globe-winning shows Killing Eve and Bodyguard in the category. Killing Eve’s Jodie Comer is also up for best drama performance as is Bodyguard’s Richard Madden. Elsewhere, there is fierce competition in some of the more established categories like The Bruce Forsyth Entertainment award. I’m A Celebrity Get Me Out Of Here! goes up against Love Island, which had its best ever viewing figures in 2018. Ant and Dec’s Saturday Night Takeaway and The Graham Norton Show also feature in the category. Love Island and All Round to Mrs Brown’s are also in the running. The serial drama, or best soap award is also always a big talking point and last year the award went to ITV’s Emmerdale. This year the show goes up against Coronation Street, EastEnders and Hollyoaks.